If our ongoing experience is anything to go by, relatively new Aussie hop variety Enigma is a cracking hop to use in lagers. Bridge Road's Enigma Pilsner is a beer that should be seen around more, while at the 2017 Fresh Hop Beer Festival, Moo Brew's wet hop Enigma Pils – the best expression of the hop to date, according to one other brewer during a Q&A we hosted there – was first to blow. 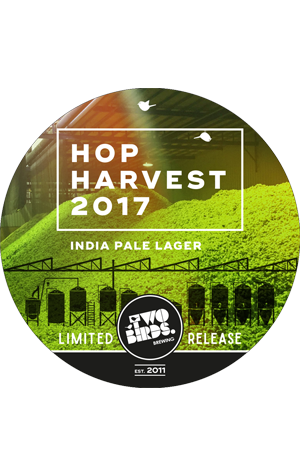 So we look forward to getting our hands on a glass of this harvest ale from Two Birds. As with many fresh hop beers around at the minute, these were flown from Hop Products Australia's Bushy Park farm in Tasmania to Spotswood and promptly put to work at The Nest for the brewery's third hop harvest brew. We're told it was "a day that smelt of promise and resulted in a beer that tastes like new beginnings." To be honest, in the face of such poetry, it feels pointless to actually describe the resultant beer, but they add: "It’s full of juicy white peach, wine-like and grassy hop characters. It’s complex, intriguing and bright and showcases all that Enigma and the hop harvest have to offer."